Defining how to maintain contact between you and customers can be difficult. There’s however no doubt that communication through smartphones is the most effective way to reach out to customers in for instance loyalty programs. Why? Because the number of smartphone users worldwide is expected to surpass 2 billion this year, representing over a quarter of the global population. This number is only expected to grow and by 2018 it is estimated to be more than 2.5 billion, or a third of the world’s population. This growth in mobile devices has changed marketing in many ways as businesses can now target people directly, via their phone, 24/7. Two of the key ways in which they do this are SMS and email marketing. SMS is one of the most immediate channels available, with a read rate of 97% within 15 minutes of delivery. SMS is much more personal and receiving one from a brand feels similar to receiving one from a friend or family member. However, this is also the reason that you do not want to bombard the customer with message after message. An example of a highly successful mobile marketing campaign from beyond the UK came from Dutch airline KLM. It wanted to encourage mobile bookings among its customers, so offered free lounge access to anyone who used the mobile booking platform. KLM took full advantage of the capabilities of mobile devices – placing the lounge vouchers in the Apple passbook / Google Wallet – and sent push notifications when customers passed near the lounge. The result was a 17% increase in visits to the mobile site and 38% more mobile revenue. Probably one of the easiest and most straightforward sender of text messages is the web application. The dashboard is self-explanatory and works like sending an email. Uploading contacts and their mobile phone numbers (MSISDN) can be done via an excel form after which a group of contacts can be formed and selected. All you have to first is register and top-up your credits to send messages. Ready to send in less than 10 minutes. If you’re using your own program and/or dashboard, connecting to an API might be a good idea. There’s a lot of documentation about integrating a connection to SMS API’s. Putting up a connection between your program and an SMS gateway API has become effortless. Try it yourself! CRM providers like ACTITO and SPLIO offer great software and services that allow you to easily reach out to your customers. ACTITO provides multichannel relationship marketing software, accessible in the cloud. It provides solutions in customer lifecycle marketing, deploying acquisition, loyalty, cross selling, and welcome programs. 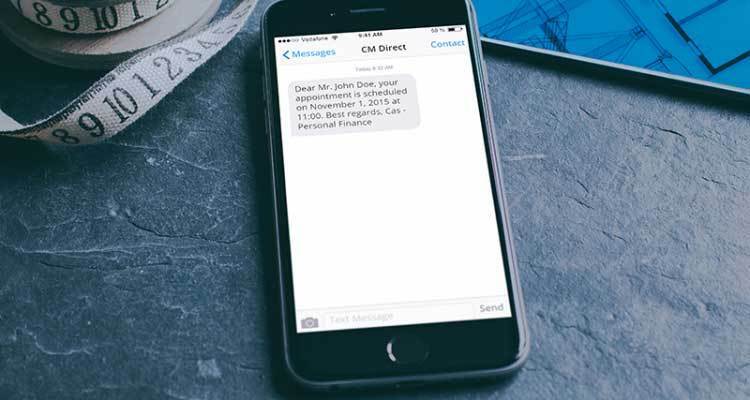 These solutions are put in place by applying innovative, leading edge CRM marketing methods, enabling 1-to-1 interactive communications through multiple channels like paper, email, SMS, and web. ACTITO uses CM Telecom’s SMS gateway so their customers can send messages to their clients. Read their story here! Got it all sorted out? If you need further assistance or more information, please contact CM! In spite of technological developments in mobile communications over the years, SMS remains a key player in communication. This might be because of the higher delivery rates of SMS compared to alternatives like WhatsApp, Facebook Messenger and Push messaging. But the user friendliness of SMS and the limited data your target audience needs to disclose for you to reach them, further add to the benefits of SMS. A couple of new developments make SMS campaigns even more valuable now.